The King of Kings (Shahanshah) of Fharas, according to ancient belief, is the manifestation of god on earth and in theory controls all world events, though of late that has been put under severe scrutiny. According to the magi, Fharas’s fire-wielding priests, the King of Kings has reigned for all life cycles of the earth, though no written records show a Fharas or King of Kings prior to 1,300 years ago. At that time, the first recorded king, Fhareedi, gained control over the High Plain (Gor Ilán) and secured power over the minor subject kings, thereafter known as the Great Lords of Fharas. It is said, in his old age, he left the High Plain and entered the low-lying tropical forest, which he cleared and founded the city of Taifun (in archaic Fharese, “Sea Port”). The written records conflict with the Order of Magi‘s assertion that Taifun is ten thousand years old. 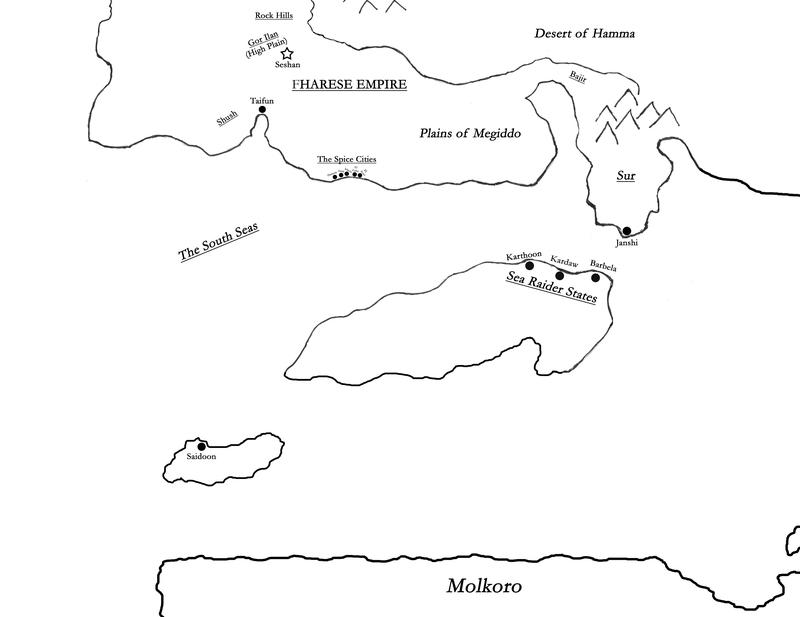 Despite the widespread destruction of the Eloesian conquerer Tarchon the Mad, Fharas continued to expand, seizing Khazidea outright, capturing control over the Spice Cities, and over hundreds of years gaining hegemony over the far-flung region of Sur and the queendom of Saidoon. By the 500s Y.E., Fharas was the most powerful nation in the world. Yet a new foe had arisen, the Empire, which would one day challenge the kingdom’s might. Fharese men practice polygamy and may have as many wives as they can afford. Women may have but one husband and infidelity is severely punished. Married women wear veils and cover their hair, while unmarried women do not. Hierarchy is strictly enforced and difficult to overcome. At the top is the King of Kings, followed by the Great Lords and their families, followed by the magi, with a vast peasantry at the bottom. Peasants may join the magi if they possess magical talent, a rare example of social mobility. The classes are clearly distinguished by their clothing. Magi are compelled to wear purple robes and white turbans, and carry staffs like shepherd’s crooks. Peasants’ clothing is limited to off-white, brown and gray. The nobility is permitted to wear clothing of bright colors — blue, red, green, and white — as well as turbans of any color for the men and colorful lace veils for the women. A reverence for fire is common throughout Fharas. In fire temples and fire festivals, great pyres are lit and animals are sacrificed as burnt offerings. The magi preside over these rituals. Some sects in Fharas believe Athra, lord of fire, is the only true god and deem all others false, while one sect in particular believes Athra the Light-Bringer is locked in an eternal struggle with the lord of night and darkness. These groups despise the other popular gods such as Mina and Issa. Clashes between monotheists in the cities and polytheists in the country are frequent, despite governmental attempts to keep order. Seshán: The seat of power for the King of Kings, the site of his titanic throne and a place of worship. A city only in name. Taifun (pop. 75,000): The largest city under the padisha’s direct control, a hive of commerce and trade. Known as “The Greatest City in All the Worlds,” it also serves as the seat of power for the magi. Haroon (pop. 120,000): A city on the Middle Sea, controlled indirectly through the brother-sister monarchy of Anakh and Astarthe. Wealthy and as ancient as Fharas, known for its red sandstone buildings and onion dome temples. Janshi (pop. 80,000): The distant capital of Sur, ruled indirectly through the pasha. Saidoon (pop. 12,000): A small city ruled indirectly through the Tiger Queen. The Spice Cities: Ruled indirectly through the Mercantors.